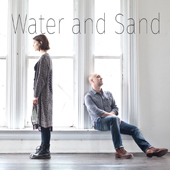 Veteran American songwriters Todd Thibaud and Kim Taylor come together to explore the nuances of intimate relationships and the constant of shifting time in a new collaborative project: WATER AND SAND. Their self-titled debut album, produced by Sean Staples, will be released on Blue Rose Records. WATER AND SAND, including additional musicians Thomas Juliano and Sean Staples, will be touring throughout Germany and Austria in October 2016. Todd Thibaud is a consistently convincing, reliable artist who always stays true to his musical vision. He does not change things up dramatically but finds variety in nuances of arrangement and production. After all, the consistently high quality of his songs and his mellifluous, warm voice create an irresistible and familiar atmosphere. This was already true of his first band, The Courage Brothers, in the early to mid-90s. With his 1997 solo debut Favorite Waste Of Time, the man from Vermont made his first mark on the songwriter/pop canopy. It was followed by a slew of classic Blue Rose studio albums Little Mystery (1999), Squash (2000), Northern Skies (2004), Broken (2008) and Waterfall (2013). Cincinnati-based songwriter Kim Taylor has toured extensively with Canadian songwriter Ron Sexsmith and friends Over The Rhine and supported songwriting heroes like Kris Kristofferson. Her songs have been featured in numerous television shows including Flashpoint, Army Wives, Smallville, Cyberbully, One Tree Hill and most recently in the UK’s flagship comedy-drama, Stella. In 2013, she made her acting debut in the Sundance and Berlinale selected independent film, I Used To Be Darker, portraying a musician mother in the throes of divorce and on the brink of a new life. Kommentare deaktiviert für WATER AND SAND – exciting duo project by Todd Thibaud and Kim Taylor! Der CD-Räumungsverkauf unseres General Stores geht in die letzte Runde!